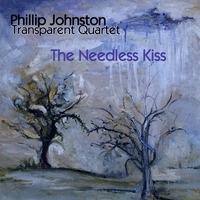 The Needless Kiss was the first CD by Phillip Johnston's Transparent Quartet, the drummerless quartet he formed in the late 1990s after leading The Microscopic Septet and Big Trouble. It was released in 1998 on Koch Jazz, but is now out-of-print, due to the corporate downsizing of that label. In addition to originals by Johnston and pianist Joe Ruddick, the group played distinctive arrangements of tunes by a variety of composers, for instance on this CD, Frederic Chopin & Raymond Scott. A saxophonist, composer and arranger of both jazz and new music, Phillip has been a significant figure in the underground music scene of New York’s downtown since the beginning of the 1980’s. He has composed extensively for film including Paul Mazursky’s Faithful, Philip Haas’ The Music of Chance and Money Man, Dorris Dörrie’s Paradise and Geld, and, recently, Stolen Life by Peter Rasmussen & Jackie Turnure & Noise by Henry Bean. He has also written for silent film, including Tod Browning’s The Unknown, The George Méliès Project, Teinosuke Kinugasa’s Page Of Madness and F.W. Murnau’s Faust. His theatre composition credits include Measure For Measure, War Of The Roses, The Comedy Of Errors, The Merchant Of Venice and Macbeth for Bell Shakespeare; Young Goodman Brown with Richard Foreman, Venus with Suzan-Lori Parks, The Anatomy Lesson of Dr. Ruysch and The Falls with Hilary Bell, and Drawn To Death: A Three Panel Opera with Art Spiegelman. Dance credits include Karole Armitage’s The Predators’ Ball and Keely Garfield’s Minor Repairs Necessary for which he won a ‘Bessie’ in 1999. This CD was originally released in 1998, and went out of print when Koch Jazz was corporately down-sized. These are copies of the orginal CD from the artists own stock. —Steve Futterman, The New Yorker.